Fred: She said my mother looked like a weasel. Ethel: Fine, I am sorry your mother looks like a weasel. 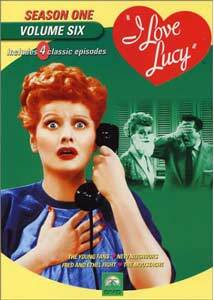 In the annals of television history it is hard to forget I Love Lucy when recalling the most classic television shows that have ever aired. Simply put, the show and it stars are iconic. From the trademark theme song to the classic moments that flicker through the memories of anyone who has ever viewed the smallest handful of episodes, it is unlikely that anyone, anywhere has not been touched by I Love Lucy. While the format of the show seems dated some fifty years after the premiere episode, there is still an undeniable freshness. Simply put, Lucy (Ball) and her husband Ricky (Arnez) live in the same apartment building as their friends Ethel (Vance) and Fred (Frawley). At some point in each episode something catastrophic will happen and each couple will endure a series of hilarious incidents,then a message is revealed and a happy ending takes place. Think of it as, well, any other show that has come along since. For inexplicable reasons, Paramount have chosen to release the series in "best of" compilations as opposed to a set containing every episode from a given season. Peggy (Janet Waldo, who would later voice Judy Jetson) is a young girl who develops a crush on Ricky after seeing him perform at the nightclub. When Lucy discovers this, she devises a plan to introduce a young man (Richard Crenna) to Peggy, but it backfires when he develops a crush on Lucy. Hilarity ensues as always, but this episode feels contrived. Three hearts out of five. When a new couple moves in nearby, Lucy and Ethel are determined to see the inside of their apartment. When the pair sneak in on their hands and knees, they are shocked to see their new neighbors are home. When they start rehearsing a play, Lucy and Ethel misunderstand and believe that their new neighbors are plotting a plan to overthrow the government. A funny episode, four out of five. When Fred and Ethel begin an all out fight, the Ricardos are caught in the middle. While trying to repair Fred and Ethel's marriage, Lucy and Ricky start to argue over who apologized first in their last argument and soon they are fighting also. Three out of five. When Ricky grows a beard for a movie audition it is much to the dismay of Lucy. When Lucy retaliates by applying a fake beard, she does so with the thought that she used a simple adhesive. In all actuality she uses liquid cement, and now the beard will not come off. The funniest episode of the set by far, four out of five. Image Transfer Review: Given the age of the original source material, I was surprised to see the image transfer look as good as it does on this DVD. The print is not free of blemishes, but sharpness and detail are each done nicely. This is likely the best that the episodes will ever look. Audio Transfer Review: The original mono tracks are offered here and as expected, it is serviceable. Extras Review: Excerpts from the original radio show, My Favorite Husband, are included. Each show is played in its entirety and are generally pretty funny. A comprehensive guest star list is offered, as are a few flubs for each episode. This is a fine "best of" set, which is great for fans who are holding off on season sets. Recommended.